(Tom Mussatto)- Born in Illinois and left as soon as I was old enough. First stop was Eastern Oregon for college. Then the Army to see the world. Married in 1969 and wife (Sue) and I lived in Fairbanks, AK for a few years in early 70's where our son was born. Moved back to IL in mid 70's and daughter was born in 1979. Retired from Shell Oil in 2000. (Tom Mussatto)- My parents tell me I was shooting a bow at age 5 but I really don't remember that far back. My earliest memories of hunting are with Dad when I was 7, he carrying a shotgun and me a bow. (Tom Mussatto)- Not really. There certainly are many in the bowhunting community I admire and respect as human beings. Jay Massey for not following the path of so many and allowing the chance for financial reward and "fame" alter his integrity, or change how he bowhunted. Dean Torges for what he has contributed to archery while at the same time trying hard to keep a low profile. One of the pleasant things about visiting TradGang is that most here are in this mold rather than one of self promotion which is so prevalent in archery today. (Tom Mussatto)- Don't really know, it happened when I was so young. I do know that Dad apparently handed me a bow when I was too young to follow him in the woods with a firearm and when the time came for the gun I wasn't that interested. (Tom Mussatto)- Have many, many hunts that are memorable. Can't recall a particular animal or kill that left any kind of lasting impression on me. I especially relish the times when I was young (and stupid) and would spend from 2 to 3 weeks by myself bowhunting in some pretty wild country. Sue won't let me do such things these days. Something about heart attack, broken leg, or some such nonsense. (Tom Mussatto)- Don't remember but I would guess it would have been a rabbit. My cousin and I are 11 months apart in age and lived next door to each other at the very edge of town. When we were old enough to ride our bikes we would bike out to the city dump and bowhunt rats. Not treerats or muskrats but "rats". The only thing I remember ever bringing home to Mom that she refused to put on the dinner table, and I brought home some pretty weird things back then. (Tom Mussatto)- Most of my hunting for the past 40+ years has been done with 68" or 70" American style longbows, most often Hill Big 5's. Arthritis has been getting pretty annoying in right shoulder past few years and recently acting up in left shoulder. 3 years ago I started using recurves of lighter weight, mostly old Pearson and Bears from the mid 60's. Heavy wood arrows, mostly 2 blade broadheads, and an assortment of small game points. Spend a lot of time sorting and matching for spine, weight, and straightness and very little time on cosmetics. As much as I shoot and the way I shoot I consider my arrows borrowed not owned so making them pretty is a bit of a waste on me. Single strap back quiver or occasionally a hip quiver to hold ammo. (Tom Mussatto)- If you have any desire to bowhunt or travel to wild places do it now. Don't wait 'til you've saved the money or gained more experience. We are losing opportunity and access to these places that I took for granted 30 and 40 years ago and they will be gone soon. (Tom Mussatto)- Don't think I have a favorite animal as such. I do have favorite places or types of places so the animals available in those places would I guess be considered my favorites. Also, I put much more emphasis on how one hunts than what one hunts so in this regard the fox and gray squirrel top the list. We can, and I do, hunt these animals just the same as I did 40 years ago, something that is very hard to do with other animals such as whitetails where the popularity and demand for these animals has drastically changed how we hunt them. Not for the better I think. (Tom Mussatto)- I like to wander around 'til I bump into something. I hate sitting on a stand, whether it be in a tree or in a bush, so seldom do it. Seems a very impersonal and passive way to "hunt" and I feel more like an observer than a participant. I very, very rarely go hunting after one particular species unless that is the only edible animal in season at the time. I am a hunting archer of opportunity and carry a large supply of assorted arrows whenever I hunt. November is a great time to hunt in IL because during that period just about everything is in season. (Tom Mussatto)- Not currently in my immediate family. Dad and Granddad hunted, granddad 'til he died and Dad until his legs just wouldn't carry him over rough country anymore. (Tom Mussatto)- I guess that would be Dad, although he was never an archer himself. (Tom Mussatto)- No. With the exception of New Zealand I've hunted about every place and every animal I have a desire to. (Tom Mussatto)- Have always made my own arrows. Made a few bows, both self bows and glass, over the years but don't really enjoy that work. Other than bows and arrows I don't have or use much gear. (Tom Mussatto)- Both. Live on a small piece of ground in the country surrounded by a lot of private ground I have access to with a variety of small game and deer and turkey but prefer to travel away from here to collect meat. This usually envolves public ground. I enjoy hunting when it's light enough to see. The animals are always out there no matter the time of day so I really have no favorite time. (Tom Mussatto)- No. In the early season sometimes a squirrel call when it's hot and squirrels don't want to play. Love calling moose but that's about it. (Tom Mussatto)- Almost daily year round. Never shoot anything I won't put on the table so this sometimes means I'm limited to frogs and groundhogs in summer months. (Tom Mussatto)- Would love to do another 3 week solo hunt in a wilderness area if my legs could handle it and Sue would let me. 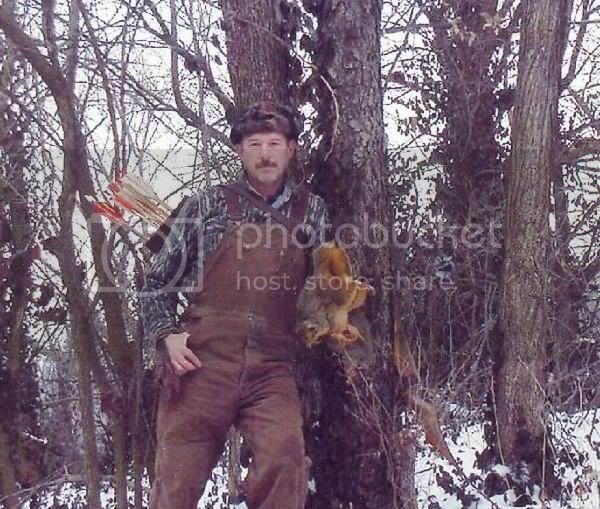 (TG)- Tell us about your passion for squirrel hunting. (Tom Mussatto)- Squirrel hunting with Dad is my earliest memory of hunting. That may have something to do with why I enjuoy it so much. I think the main reasons though is that commercialism has not invaded the sport so therefore it has not changed and we can enjoy it today the same way we did 40 years ago. And, unlike most of our other small game, squirrels have not been nearly as decimated by modern use of the land. It's as good today as it has ever been. And then of course there is the squirrel himself. Spend time observing squirrels and you just have to come away with an appreciation for the way they appear to enjoy life and their tenacity in clinging to it. (TG)- What got you interested in filming? (Tom Mussatto) - I guess, like hunting, Dad got me interested in filming. He was always carrying around a little 8mm camera. I started using it when I was in my early teens. Those old films are priceless today. My wife and I always carried an 8mm or Super 8 camera on our trips and in the mid 80's moved to video. The older I get the more use I make of the camera and the less I use (for killing anyway) the bow. (TG)- In you opinion, Who are the pioneers of our sport? (Tom Mussatto) - I don't know how much actual impact they had on the sport but I personnaly have always been fascinated with the hunts Nagler, Case, and Klopsteg made in the 30's, 40's, and 50's. So much so that I spent time years ago trying to duplicate their hunts in Northern Ontario by following as best I could from their writings the pathes they took. This was before Ontario went to a system of moose tags being allocated by district. Since they crossed several of these districts it can't be done today. (TG)- What are your views regarding the pioneers of our sport? (Tom Mussatto) - I don't think they are any worse or better than the dediciated archers of today. They pursued their passion the same way we do today and I doubt they looked upon themselves as pioneers. 50 years from now tthe Massey's and Schafers will be looked upon as pioneers. (TG)- How important do you think it is that those guy's legacies are remembered? (Tom Mussatto) - It is important. We learn from history and the archers from the past are our history. Unfortunately, I don't think enough of us today know much about our past. Go to an archery gathering of any kind and start asking different folks about Stevenson, Nagler, Rich, etc. Most times you'll get a blank stare, and this is a shame. (TG)- How could we all do a better job of preserving and promoting Trad Bowhunting? (Tom Mussatto) - Take more responsibility for what we say and do. Everybody's watching. I cringe when I hear archers, and especially supposedly traditional archers, talk of "sticking" an animal, and using hunting methods that, while they may be legal, are not in keeping with truly fair chase guidelines.